Lancelot is one of the most well-known knights of the Round Table, infamous for his ill-fated romance. The Lancelot Sword with Plaque features a stainless steel blade inspired by the enduring medieval tale of honor, love, and betrayal. This knightly blade draws its design elements from medieval weaponry and heraldic styles, featuring Lancelots coat of arms upon its rounded, brass tone pommel. The slightly contoured grip is textured to resemble wire wrapping, helping assure a firm hold. Decorated with an elegant red fleur upon its center, the crossguard features two arms that angle towards the blade, their ends capped with the heads of beasts. Subtle etching decorates the ricasso of the blade near its crossguard. 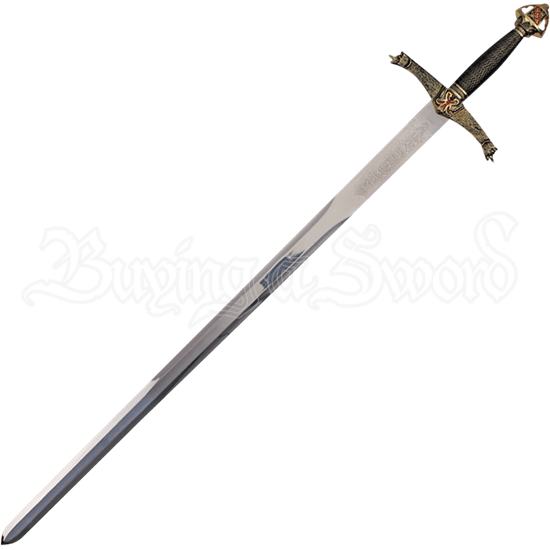 For those enthralled by the Lancelot myth or simply interested in Arthurian legend, this decorative steel sword is a must-have collectible. With its included wooden wall plaque, this replica sword is easy to display, making it a great addition to home decor or gift for a loved one.